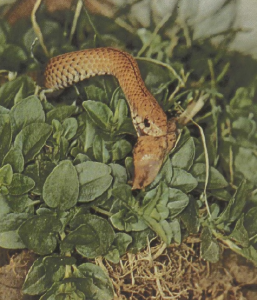 These small snakes represent a parallel to the red-bellied snakes of North America in feeding extensively upon soft-bodied slugs and similar prey items. The 6- to 12-inch snakes are often very common although not obvious. Several species range very widely across the continent of Africa. These slug-eaters seem to recognize their prey by smell mediated by the tongue. During the day they may follow the movements of their prey by sight as well. During attack, the snake gapes widely and strikes the extended slug at midbody; it moves its jaws quickly over the prey and thus neutralizes the slug’s capacity to produce sticky slime.